Among late Repin settlers migrating to the east, one Trans-Uralian group was especially successful, developing the Afanasevo culture in the Altai region from ca. 3300 BC. The first to propose a common origin of Yamna and Afanasevo based on their shared material culture was I. N. Khlopin, and this hypothesis has been refined to a more archaic cultural phase (the Repin culture), based on archaeological remains, radiocarbon dates, and recently also ancient DNA (Morgunova 2014). Before the emergence of Afanasevo, the region’s most characteristic Eneolithic remains (ca. 4000–3250 BC) were geometrically ornamented pottery found in Botai, Kozhai I, Razboinichij Ostrov, etc. These remains are synchronous with the Repin culture, hence Eneolithisation of the west Siberian region lagged behind that of the Pontic–Caspian steppe, demonstrated also in the absolute lack of copperworking, and scarce, isolated finds of copper goods (such as an adze, and a knife with leaf-shaped blade), which show typological similarities with those of the Pontic–Caspian steppes (Morgunova 2014). The appearance of Eneolithisation, including domestic animals, and metalworking in the Trans-Urals regions of western Altai and Tian Shan shows a close relationship of the whole process—typology, metal origin, and metalworking—to the early Yamna metallurgy in the Cis-Urals region (see §VI.1.4. Volga–Ural region). The appearance of intermediate materials in the territory of eastern and north-eastern Kazakhstan, showing syncretic decoration of Yamna and local Eneolithic cultures of comb-geometric pottery, strengthens the direct connection of the Volga–Cis-Urals area to the Altai precisely during this period (Morgunova 2014). Burial similarities include the pose of the skeletons, the presence of organic bedding, the sprinkling of ochre, and the forms of the burial pits; differences include the use of stone constructions, and predominance of the south-western and western orientation of the dead (orientation to the east is exceptional). The deposition of pottery increases in relation to early Yamna, and it is marked by its heterogeneity, including its shape (tappered, ovoid, tall body, etc. ), ornamental composition showing comb-like stamps, which was no longer typical of the steppe zone, but was common in the late Neolithic in the Urals (Morgunova 2014). Another strong parallel includes the earliest pictorial tradition of petroglyphs, the Yamna–Afanasevo tradition, characterised by the symbolic depiction of sun-headed men and animals (Novozhenov 2012). Noteworthy features of the material culture are the pottery with swollen body and narrowed neck, which make it possible to assume its relation to late Repin ceramics. Also interesting is the technology used, including moulds, typical of Yamna dishes in the Urals. On the other hand, pottery is marked by considerable syncretism and heterogeneity (Figure 24). Metal is still rarely encountered, but those found show an origin in the Circum-Pontic and Maikop horizon, like those of the Don–Volga–Ural region (Morgunova 2014). Figure 24. Materials of the Afanasevo type. 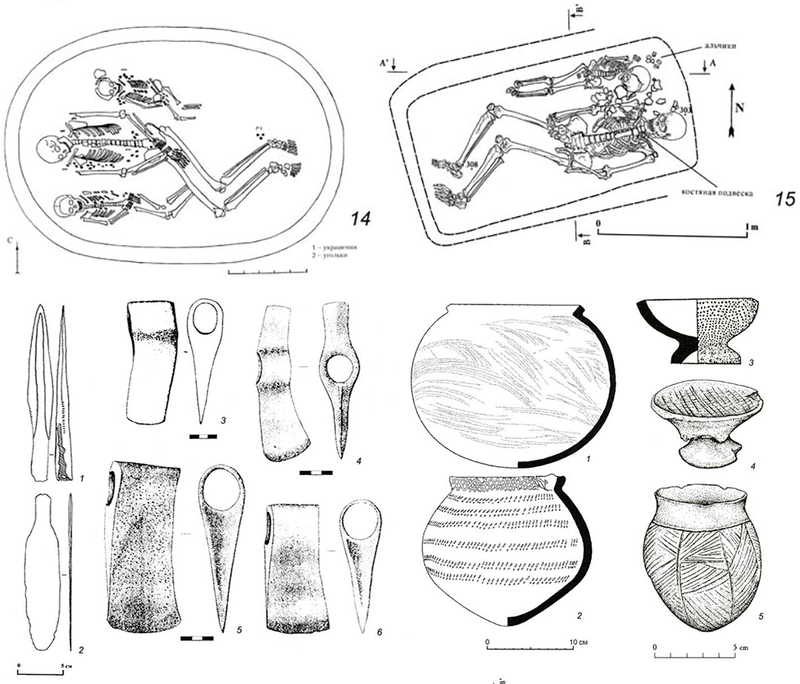 Top: burial types (after Larin 2005); bottom left: copper products (after Kovaleva et al. 2010, Grushin et al. 2010); bottom right: pottery (after Polyakov 2010, Kovalev, Erdenebaatar 2010). From Morgunova (2014). The predominant nutrition of buried skeletons is meat, and the main economic occupation of Afanasevo population is sheep and cattle breeding, not known previously in this territory. The presence of sheep, cattle, and horses, now predominant in the region, is typical of the Pontic–Caspian steppes (although the Botai also knew horse-riding before the appearance of Afanasevo). The appearance of Afanasevo must therefore be linked to an early, demographically strong migration wave of late Repin/early Yamna settlers from the Volga–Ural region, following steppe and forest-steppe environments favourable to cattle- and horse-breeding, and possibly in search for new metal deposits (Morgunova 2014). Paradoxically, though, neighbouring Trans-Urals forest regions including the Botai culture of northern Kazakhstan received practically no influence from Yamna, in contrast to the neighbouring Volosovo–Garino Bor society, adopting metallurgy, productive farming (see §VIII.15.2. Balanovo), which suggests that migrants by-passed powerful cultures of combed geometric pottery. Nevertheless, the appearance of censers or ‘incense burners’ in the Altai ca. 2600–2000 BC, typical of the Catacomb and Poltavka cultures, suggests contacts of late Yamna groups with the region, possibly triggered by later waves of expansion into the Urals (Morgunova 2014). Afanasevo coexisted with the Okunevo culture for ca. 100 years (ca. 2600–2500 BC), before being fully replaced by it. Okunevo developed for ca. 800 years, until about the 17th–15th centuries BC, when they were replaced by the expanding Fëdorovo culture. The different stages of the Okunevo culture have been radiocarbon dated, the Ujbat stage to the 26th–23rd c. BC, the Chernovaya stage to the 22nd–20th c., and the beginning of the Razliv period is dated ca. 19th–18th c. BC (Poljakov, Svjatko, and Stepanova 2018). Tocharian shows peculiar archaisms and innovations compatible with a development isolated from other Late Indo-European dialects. Its strong differences with neighbouring Indo-Iranian and with other Late Proto-Indo-European dialects in general indicates an extensive period of linguistic separation from the common trunk. The early spread of a group from the late Repin culture into the Altai–Sayan region, emerging as the Afanasevo culture ca. 3300–3100 BC, is compatible with the described early isolation of the Pre-Tocharian group from a Late Indo-European-speaking Yamna community in contact in the Pontic–Caspian steppes (Anthony 2007). Afanasevo individuals shows full Steppe-like ancestry, coincident with Steppe Eneolithic samples, without sizeable EEF contributions as found later in Yamna (Wang et al. 2019), which is compatible with its origin as an early offshoot from the Don–Volga region. Most published samples from Afanasevo (ca. 3300–2500 BC), the supposed community of Pre-Tocharian speakers, are of haplogroup R1b1a1b1-L23, most probably R1b1a1b1b-Z2103 (Hollard et al. 2018), and many among them possibly of R1b1a1b1b3-Z2106 lineage (Narasimhan et al. 2018). Only three samples are of haplogroup Q-M242, all with a mean radiocarbon date later than 3000 BC, which implies their potential association with emerging Bronze Age cultures from Mongolia, or a resurge of previous populations (see §viii.20.3. Turkic peoples and Mongols). Importantly, no Afanasevo-related ancestry is found in south Asia in the 3rd millennium BC, which discards any important migration through the Inner Asian Mountain Corridor in this period (Narasimhan et al. 2018).